Check out all the latest patch notes for the battle royale. Fortnite never stays still. One moment everyone's worried about interdimensional rifts, the next it's evil monarchs and magical swords. Currently, it's going through its pirates and ninjas phase in Season 8. It can be hard to keep track of it all the updates, but you can always return to this log to see what's new. Below you'll find the most recent Fortnite patch. 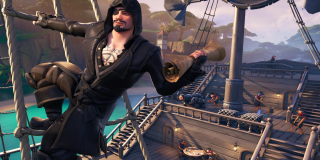 Epic released the latest Fortnite update on March 6, introducing something every pirate needs: treasure maps. There's buried treasure hidden across the island, but with a map, you'll be able to hunt it down and dig up some legendary loot. The update also reduces the availability of infantry rifles and clingers, while vaulting bottle rockets. -It’s a map that is used to track down buried chests on the map. -Chests contain a trove of legendary loot. -X marks the spot! The chest must be dug up using a pickaxe. -There is a limit of one map held at a time. -Can be found from Floor Loot and Chests. -Reduced the chance of receiving an Infantry Rifle from Chests from 14.41% to 13.39%. -Reduced the chance of receiving an Infantry Rifle from Floor Loot from 2.41% to 2.24%. -Reduced the chance of receiving Clinger’s from Chests from 9.42% to 5.52%. -Reduced the chance of receiving Clinger’s from Floor Loot from 1.27% to 1.02%. -We are running a new type of tournament as a test of several format updates. -Extended Hours: This event consists of a single session which lasts until March 9th 00:00 GMT. -Due to the extended hours for this event, Duo players will each have their own score that remains when changing partners. -Note: Due to the playlist featuring matchmaking based on your score, the quality or availability of matches may differ at certain times of day. -Each match played will reduce your score by two points in the form of a ‘Bus Fare’ at the start of the match. -Tournament scores cannot go into the negatives - at the end of a match, if a player has a negative score for the tournament then their score will be reset to zero points. -Players are still matchmade against opponents with similar point totals. -Matchmaking will wait for up to 8 minutes before creating a match with the closest players available. -Matchmaking will search in a considerably wider points range after 4 minutes of searching. -Scheduled 3-hour event, check tournament in-game for your local time. -Note: NA East and NA West are now separate for scheduled tournaments, and no longer share a leaderboard.